I was honored to feature Freddy Fresh on the bill at a fundraiser for Some Assembly Required a couple of years ago. The photo is from that event. This intro is pulled largely from the press releases which were sent out for that show - so I'm getting a little break this week, in a way. DJ Retroblast opened for Freddy Fresh at the Triple Rock Social Club that night, and I am forever in their debt! Freddy Fresh is among the most active and prolific American music artists in the world. He has released over 150 singles and 10 albums, over the past 20 years, and worked with everyone from Eminem, Fat Boy Slim, Puffy, Tito Puente, Grandmaster Flash, Gus Gus, Iffy, Clinton, Delakota, Heaven 17, Boogie Down Productions, Schooly D, The Freestylers, SBK, MC Brown Mug, Angel Dust, Jacknife Lee, Simply Jeff, Cosa Nostra, Gadagong, Double Six, Vitro, D & D, Baden Powell, Papa Mantra, Kitachi Brutal Style, El Loco Gringo, Meat Beat Manifesto, Le Tone, Courduroy, and Zebda. 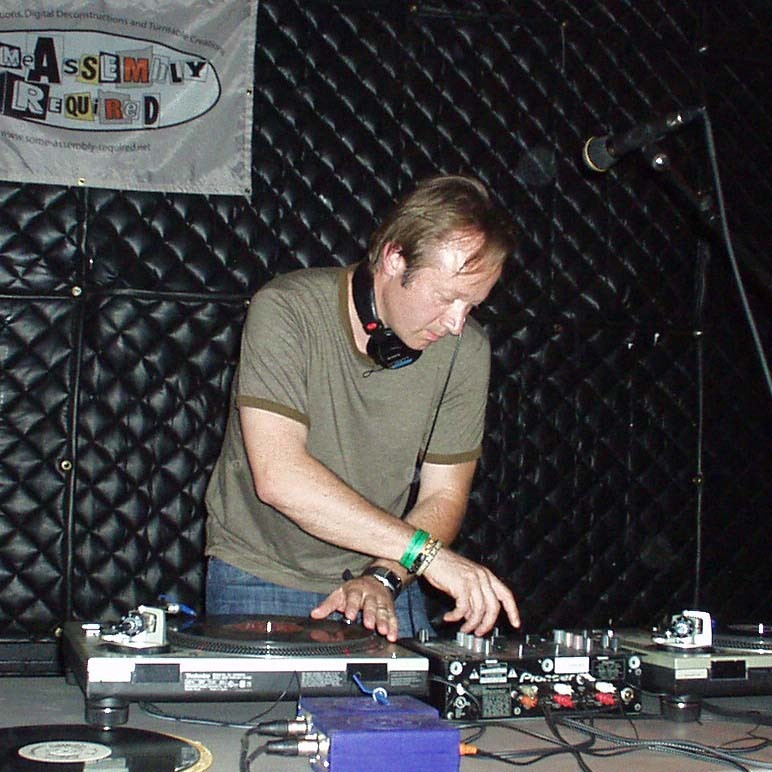 He’s been featured on over 200 radio broadcasts including: The John Peel Show, BBC Essential Mix, Coldcut's Radio show UK, Beat Radio Los Angeles, Ministry of Sound Sessions, Groovetech radio (Resident), Some Assembly Required and many others. He has performed in over 31 countries including: Moscow’s Olympic Stadium, Singapore (Zouk Club), Argentina, Chile, Puerto Rico, Budapest Hungary, Czech Republic, UK, Germany, France, Sweden, Norway, Canada, Japan, Australia, New Zealand, Poland, Greece, Spain, Portugal, Colombia and more. He's well known for his work as DJ and Producer, and we're proud to feature the SAR interview with Freddy Fresh at the podcast this week. As a bonus, here's the SAR Q&A with Freddy Fresh! *Name: Freddy Fresh, although I have gone thru many other aliases. *Are there any additional names used to describe this project: Depends on what project you're presenting... I have done many custom mastermixes, etc. *Do you use a pseudonym? (From discogs.com) Analogical Mind, Burundanga, DJ Hud, DWFS, Federico Fresh, Freddie Fresh, Freddy Fresh, Freddy Fresh & His Orchestra, Frederick Frisch, Frederick Schmid, Fresh Fred, Invisible Man, Loco Puertoriqueno, Modulator, MPC Genius, Nitrate, Tahnja. *Tape manipulations, digital deconstructions or turntable creations: Depends... My mastermix mode would be turntable creations. Actually, digital manipulation of sounds via MPC 4000. *What is your creative/artistic background: (from bio) Although Fresh grew up a gothic rock/new wave junkie, a trip to the "boogie down" Bronx in 1984 introduced him to the thriving N.Y.C. hip-hop scene. Instantly smitten, Fresh began collecting DJ tapes (Shep Pettibone, The Latin Rascals, Marley Marl, anything he could get his hands on) and, of course, records -- everything from Jonzun Crew and Newcleus to Liquid Liquid and Cerrone, Shannon and Cat Stevens -- and his collection has since grown to thousands of phonograph records (making his side gigs as a DJ a bit easier). Fresh's first work behind the boards came via Bronx legends Boogie Down Productions, with Fred remixing a track for a B-side release and from there, Freddy began piecing together a studio, collecting many of the ancient analog and modular synthesizers that give his records their distinct, almost studio-jam feel (he mixes all his tracks live and sequences with an MPC 2oooXL and an MPC 4000). *History: DJ: 1983. Producer: 1988, International DJ: 1993. *Philosophy: Create things I'd like to hear, if I had to listen to something. *How would you like to be remembered: Man who was dedicated to making innovative beats & sounds. Thanks to Freddy Fresh for being the featured artist this week. For more info, check out his official website, and be sure to download this week's podcast (episode 112) to hear our feature on Freddy Fresh, including a phone interview with the artist. That's it for this week. Gearing up for some big projects this fall, and am even starting to think about changing the direction of the playlists again, for the podcast! More and more radio stations seem to be interested in syndicating the podcast, in which case I'm thinking I should just podcast the current episodes. I'm thinking I may start in January, with the first episode of the 4th season. What do you think? If you have any thoughts on the show, in general - you can always drop me a line, at: assembly (AT) detritus (DOT) net. Until next week - Thanks for listening!